Dubai, UAE, 19th April 2016 –While this is the age of prodigious telecommunications, SMS is one of the trendiest and most effective forms of it. However, when it comes to sending SMS to every single targeted potential end user, it is undoubtedly too challenging since no one can procure the mobile numbers of a host of would-be clients. Moreover, gaining access to the right SMS gateway is another hassle. 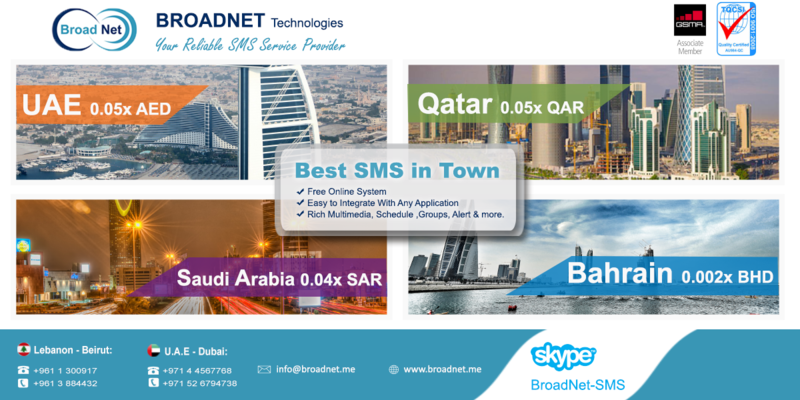 At the crossroads, BroadNet Technologies surfaces as a premier and reliable telecommunication service provider offering bulk SMS Gateway offers and reseller solutions for reselling clients in Saudi Arabia, UAE, Qatar, and Bahrain at most affordable price rates. “The innovative Reseller Partner Program is comprised of our regular as well as up-to-date products and services. The program is now also much more available in terms of financial benefits, whilst offering a broader spectrum of support and marketing services to both new and existing resellers in the aforesaid four different Middle East locations. To help our partners and resellers better compete and enhance the level of business productivity in today’s cutthroat market, we at BroadNet Technologies have revised the SMS reseller program to offer wide-ranging prodigious discounts and benefits to the resellers. These benefits will contribute monumentally to enable our partners and resellers to thrive and succeed.” He added. BroadNet Technologies new bulk SMS Reseller Partner Program for resellers in Saudi Arabia, UAE, Qatar, and Bahrain will come into force from today only. This innovative bulk SMS Reseller Partner Program is a cardinal part of the ongoing BroadNet Technologies bulk SMS offers. Existing and potential end users interested in learning about and availing of Bulk SMS reseller program should visit www.BroadNet.me.